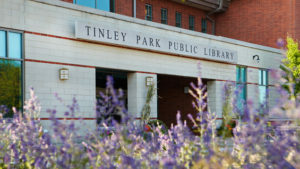 I was sweating bullets prior to the debut of my Food for Life program at the Tinley Park Public Library. I had just arrived at the library to set up my computer and test my out my slideshow. To my horror, their was no podium to be found. Instead, the area where the podium normally sat was covered by a giant stage. It turned out that the library had a summer play series for kids that morning and had completely reconfigured the conference room. I began to freak out as my slideshow prevents me from going off topic and rambling. My talk would be a complete disaster without it! Audience members started filing in, many of which were my family and friends, that only added pressure. My nervousness started to increase and my heart began to race. What if I bomb tonight! No one will ever come back for my next talk. Then out of the corner of my eye, I saw my friend Jill walking towards me. She had a solar dancing flower in her hand. She handed me the flower and told me it was a gift form her mom. It instantly put a smile on my face, decreasing my stress level. I thanked her for the flower and took a few deep breathes to gather myself. I surveyed the room and saw the podium where I hooked my slideshow up to tucked away in the corner. I quickly traced the cable leading to it and hooked up my computer. The projector instantly recognized my computer and mirrored my slides to the screen beautifully. In a matter of minutes, the crisis was avoided. The solar dancing flower saved the day! This entry was posted in Mojo Chronicles. Bookmark the permalink.